GISCafe Voice: What do the improvements in Trimble VISION provide? The improvements to the overall Trimble VISION technology include both the instrument hardware as well as the field and office software enhancements. The imaging sensor has been enhanced to improve the quality of images captured and provide the ability to adjust the image settings depending on the environment. Improved imagery makes it easier to communicate conditions to stakeholders and improves the results of photogrammetric deliverables in the office. The user also now has the ability to add important information (e.g. annotation) to images in the field within the Trimble Access software and to rapidly generate 3D point clouds within the Trimble Business Center software. Customers can collect imagery with VISION equipped total stations, or with the Trimble V10, and then use the images to visualize, annotate, extract point-based features or generate an entire 3D point cloud surface. Adding field information and extracting surfaces allows customers to better describe in-field reality while increasing productivity. GISCafe Voice: What is the SureScan technology and why will it benefit the total stations it is now a part of? The SureScan technology included in the new Trimble S7 and Trimble S9 instruments allow users to collect information more intelligently. With SureScan, radial divergence, which can occur with other scanning instruments, is eliminated. This creates an even grid of points over the entire scanned area. Users capture data more efficiently and ensure they only capture the data they need. Field time is significantly reduced and data quality and usability is improved. GISCafe Voice: “A new total station data editor enables fieldwork to be rapidly reviewed and allows surveyors to create deliverables with confidence.” How does this compare with what was previously available? Trimble Business Center has long supported the integration of multiple data types including total station data. The new editor provides a more traditional “field book” view of the data, which offers a more efficient method to review and perform quality checks on field data. In addition, the editor supports the individual entry of total station measurements in the same field-book view. This capability allows customers to easily enter manually stored field data by providing an interface that mirrors field-booking processes. The improved capabilities improve productivity and data confidence via the new tools to rapidly review, edit and quality check total station data. GISCafe Voice: ‘The Trimble TX8 3D laser scanner now offers greater accuracy (down to 1 mm) and streamlined onboard operation when measuring to longer ranges, decreasing the field time required for capturing reliable high-accuracy data. Enhanced tools in Trimble RealWorks® software version 9.1 further reduce the time to produce high-quality deliverables from Trimble TX8 data. The new version of Trimble RealWorks software includes improved workflows for creating floor settlement plans and 3D pipeline models as well as complete storage tank inspection and reporting capabilities.’ How does this compare with the previous products from Trimble? The recent changes to the Trimble TX8 are focused on simplifying operation and versatility for use in more types of scanning applications and scenarios. Users can conduct high-precision scans and long-range scans easily via the simplified user interface. The ability to pause scans, delay the start of scans, and operate the Trimble TX8 via a remote controller also make it easier to capture high accuracy data in high traffic areas, on elevated tripods, and in downhole scenarios. The automated classification and modeling in the Trimble RealWorks Advanced-Tank Edition is precisely tuned for storage tank spatial inspections following API653 Standard guidelines. The new release has streamlined and automated many of the steps required to generate tank deliverables, such as cross sections and volume tables, allowing customers to generate a solution within a few hours as opposed to days. Other tools such as the new Ground Extraction feature have also been automated to simplify the process and reduce the time required to generate a final deliverable. The ability to easily generate final deliverables from 3D point clouds is a critical requirement from Trimble’s customers and something that we are continually improving. For modeling other assets Trimble RealWorks has tools for virtually any object type. In addition Trimble RealWorks has a direct connection to SketchUp that allows customers to easily select planes, edges, guide lines and points from 3D scan data. These objects can then be easily utilized within SketchUp for rapid modeling of objects and scenes. GISCafe Voice: Regarding GNSS: what kinds of cost/time savings will this enhancement provide for users? 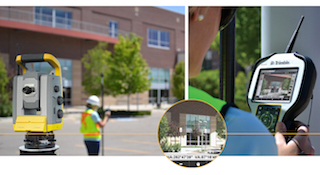 GISCafe Voice: Survey, engineering and civil infrastructure professionals can now generate dense point cloud deliverables in Trimble Business Center from images captured using the Trimble V10 Imaging Rover. Will they be able to collect and process point cloud deliverables with this Rover? How will that work in a workflow, for example? Yes, that is correct. The Trimble V10 Imaging Rover provides an easy-to-use, highly portable and fast means of collecting detailed images while simultaneously collecting survey grade point positions. Trimble Business Center software combines the survey-grade measurements and imagery to produce orthophotos, point clouds, and meshes. The point clouds can be used to generate a wide range of deliverables, such as 2D/3D CAD line work, 3D surfaces, cross-section reports, volumetric reports, etc. 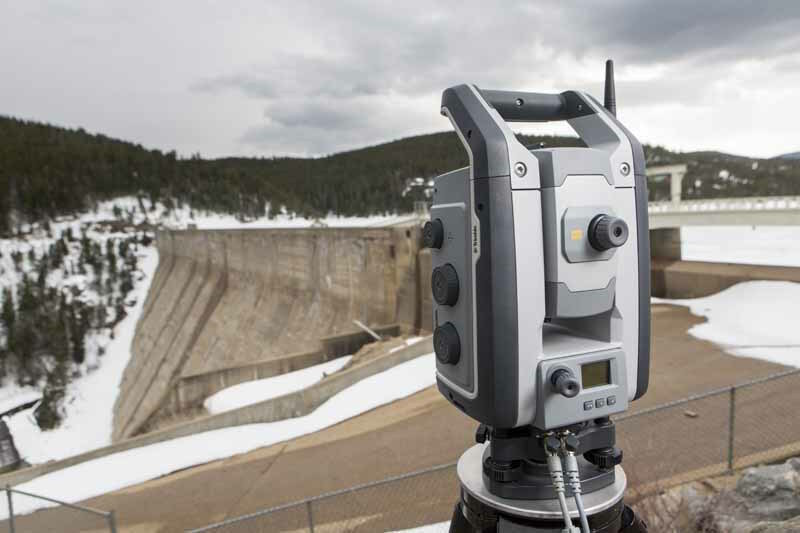 The ability to rapidly measure and model from imagery provides new capabilities with minimal changes to field procedures for survey professionals measuring primarily with total stations and GNSS systems. For applications such as building facades, bridges, stockpiles and mining, customers can reduce time spent collecting data, while still obtaining accurate and rich data sets to quickly produce end deliverables in the office. This entry was posted on Tuesday, May 5th, 2015 at 10:29 am. You can follow any responses to this entry through the RSS 2.0 feed. You can leave a response, or trackback from your own site.